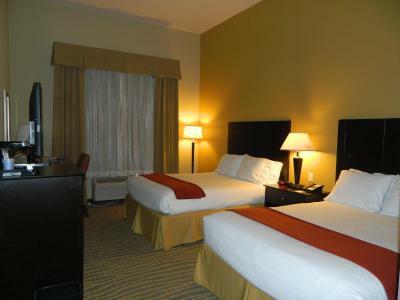 Lock in a great price for Holiday Inn Express & Suites Gallup East - rated 9.1 by recent guests. Room was comfortable and good breakfast. Restaurants too far away and those suggested to us were not what we wanted. We just went to Denny's and had waffles which was fine but not what we were looking for.. The room was quite comfortable, the pillows were wonderful and very quiet area. It was clean and welcoming and comfortable . Staff was helpful and friendly. Slept so very well and loved having firmer pillow. The bed unfortunately was not like a cloud.the breakfast was ok.
Top Frühstück, schöner Innenpool, gute Lage und sehr freundliches Personal. I've stayed here before many times. It's my favorite place to stay in Gallup. Good location, good food and gas stations close to the freeway. It's on the edge of town so traffic is not too congested. Für ein Motel ist das Frühstück recht gut. Kaffee auf dem Zimmer wird stets aufgefüllt. Wir haben uns wohl gefühlt. Featuring an indoor swimming pool and fitness centre, this Gallup, New Mexico hotel is 10 minutes’ drive from Western New Mexico University. Free Wi-Fi is provided in all contemporary rooms. Offering free Wi-Fi, this air-conditioned room provides a flat-screen cable satellite TV, a desk and a seating area at Holiday Inn Express & Suites Gallup East. Select suites feature a separate living area. A free breakfast is provided daily for guests at Gallup East Holiday Inn Express & Suites. A business centre and launderette are provided onsite. El Malpais National Monumen is 115 miles from Holiday Inn Express & Suites Gallup East. Albuquerque International Sunport is 140 miles away. This property also has one of the best-rated locations in Gallup! Guests are happier about it compared to other properties in the area. This property is also rated for the best value in Gallup! Guests are getting more for their money when compared to other properties in this city. 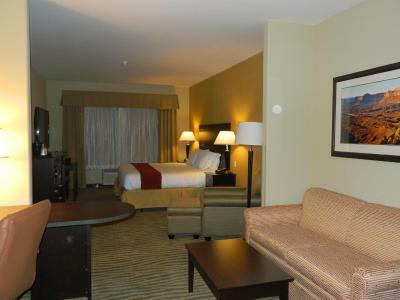 Holiday Inn Express & Suites Gallup East has been welcoming Booking.com guests since 5 Sept 2012. 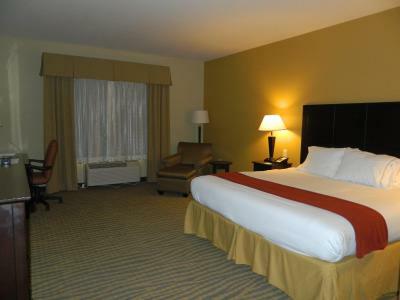 When would you like to stay at Holiday Inn Express & Suites Gallup East? Offering free Wi-Fi, this air-conditioned room provides a flat-screen cable satellite TV, a desk and a seating area. Offering free Wi-Fi, this air-conditioned disability access room features a roll in shower, grab bars, a raised toilet and an adjustable shower head. Offering free Wi-Fi, this air-conditioned disability access room includes grab bars, a raised toilet and an adjustable shower head. Featuring a separate living area, this air-conditioned suite offers a flat-screen cable satellite TV, a desk and free Wi-Fi. 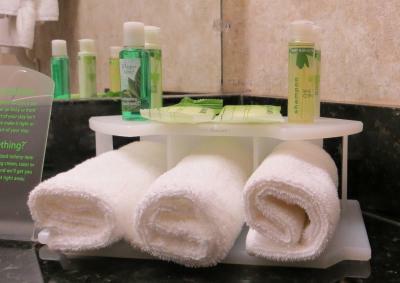 House rules Holiday Inn Express & Suites Gallup East takes special requests - add in the next step! Holiday Inn Express &amp; Suites Gallup East accepts these cards and reserves the right to temporarily hold an amount prior to arrival. Holiday Inn Express & Suites Gallup East accepts these cards and reserves the right to temporarily hold an amount prior to arrival. The system was down and they sent me to the hotel across the street. Not the hotels falt just a little inconvenient. The bed not good..room plain looking.